This religious speech was written by a visitor to this site, Katie. She gave this speech as she graduated from homeschooling. It's beautifully written and very well organized. As you read it, see how she sets out her points and elaborates on them, and also how she concludes by summarizing everything she has said. Finally, she delivers an appropriate quote, making her words even more powerful and memorable. Use this religious speech for inspiration to craft your own compelling speech for graduation. And huge thanks to Katie for sharing it with us. 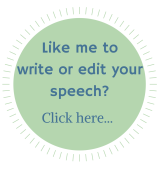 If you would like to share your own graduation speech with visitors to Best Speech Topics, please scroll to the bottom of the page to submit it! I'll publish it on Best Speech Topics to inspire and help others' to write their own presentations. You may also like to take a look at these quotes for graduation speeches that may help inspire you with a topic around which you'd like to focus your speech. Brothers and Sisters, thank you all for coming! The past twelve years of homeschooling have not been easy, but I am grateful for all I have learned. Not only have I learned the essentials of life, but I have learned to treasure this awesome truth: God is love. When I was just a few years old, I dreamt of the day I would begin school. However, after a couple years, I couldn't wait to graduate. Well, today's the day and I will soon receive my diploma, but this is not the end of my learning! I hope to grow each day in my understanding of God's truth, the gospel; to be a servant, daughter, sister, wife, mother, friend - and whatever else the Lord has for me. Most importantly, however, though I am moving on in life to something other than school, I still want to learn to love like Jesus. I want to have the same unselfish, universal, and undying love that He has because I believe that He created us to be loved by Him and to love like Him. What does it mean to "love like Jesus"? To understand, we have to know what love is. What is love? Ask yourselves the question - what is love? I don't believe any one of us fully understands what love is. Love is so simple and yet so complex; it has many aspects. Today, I would like to share with you a few of these aspects and how we are called to love like Him. How can love be so much? Well, in truth, this is only a small fraction of what real love is, but love is all that it is because God, who is greater than everything, is love. In saying this, it brings me back to my first point; God is love. "Beloved let us love one another, for love is from God and whoever loves has been born of God and knows God. Anyone who does not love does not know God, because God is love." (1 John 4:7-8) Obviously, we cannot love without God; love and God go together hand in hand. It is impossible to separate the two; they are one. And in being Love, the creator of the universe, has strokes of His love painted everywhere and sometimes in measures so immense, we can't understand. The greatest commandment of life is to love God and the second is to love our neighbor as ourselves. Since God is love and we are His children, we are required to love constantly. Just as we are lost without God, we are lost without love. Therefore, we must love with God's love. Second, God's love is a gift. Though I had been taught this all my life, I never really understood what that meant until February of 2011. God is so good and righteous and I am so sinful, there is nothing - absolutely nothing - I can do to deserve Him or His love. The only way it is possible for me to love is by accepting the greatest gift ever offered - Jesus. In Him there is love. I cannot love with my own strength and it's impossible for me to earn God's love or approval. I used to take it for granted that He loved me, that my family loved me, and that my friends loved me. I had worked hard to receive their love; didn't I deserve it? I loved giving gifts to people or helping take care of small children and feeling their love in return; it made me feel good (for a little while). Shouldn't I have received God's love in return for all that I did for "Him" and others, too? NO! Once God opened my eyes to see inside my heart, I realized that I had been doing "good works", not for others and not with His strength, but on my own and for myself. I was being independent from God. I thought I could do it on my own; until I realized that I couldn't separate love and Christ. If I wanted to love, I had to accept God's role in my life as Father, Friend, and love provider. When someone gives us a gift, do we normally feel like we need to pay for it? No, we receive it and enjoy it, understanding that it is a gift of love. It is the same with God's gift; we need to accept His love just as we would accept a gift from a friend. The third aspect we will look at is this; love forgives; yes, I said forgives. Boy, is it hard to forgive! Perhaps it's one of the hardest characteristics of love for us to practice; at any rate, we are commanded to forgive. Once again, our greatest example is Christ Himself. In our sin, we cursed His name, spit on Him, mocked Him, denied Him, and crucified Him, but in His love He forgave us and He now calls us to be like Him and to forgive like He does or else we will not be forgiven. For how can we expect forgiveness if we ourselves cannot show forgiveness? A great example of this can be found in Matthew 18 where Jesus tells the parable of the unforgiving servant. Also in Ephesians 4 verse 32, we are told to, "Be kind to one another, tenderhearted, forgiving one another, as God in Christ forgave you." What can be more clear? If we love God and follow Him, we must forgive others as He has forgiven us, no matter what they have done to others or to us. In Christ's love, we must completely forgive without holding anything back as He has done for us. This brings me to my fourth point; love is unconditional. It's for the believer and non-believer; the humble and the proud; for a friend and for an enemy; to the blessed and the cursed; to the real as to the hypocrite; whether one is rich or poor; to the honest and dishonest alike. We're all sinners and you and I are no less in deserving God's wrath than our neighbor down the street. The difference, however, is that we have chosen to accept God's gift and now we have the advantage and the freedom to show true and unrestricted love to everyone as the Giver commands us to. With the hope that they, too, will one day receive this gift that is offered them, in spite of all their sin; that they can look beyond themselves and see the love that is waiting for them if they will only accept Christ. Fifth, love is a sacrifice. If people could just accept the gift of love that was so clearly demonstrated in God's sacrifice of His only beloved Son Jesus Christ, to a horrible death on a cross, to save all who believe, from His wrath. This is the greatest act of love ever shown. For Christ to lay down His life that we might become a part of His family and live in eternity with Him, is breathtaking, it's incomprehensible. Nevertheless, He did it and we, God's children, are commanded to do the same; to lay down our lives for others. We must love when it pains us, when it is hard, otherwise it's not a sacrifice. In Matthew 5 it is recorded that God says that we must love our enemies and pray for those who persecute us. Is not this a sacrifice? For it's easier to love those who love us. 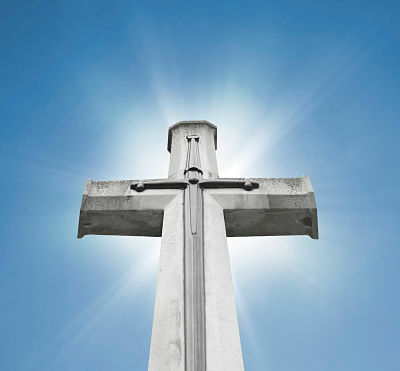 Nonetheless, loving Christ and even our fellow brothers can be a sacrifice; to lay down our own lives, our wills, and desires for anyone, is not easy, but it is love. Finally, true love is everlasting. There is no end to love. God's love is an undying love. His steadfast love endures forever, as we clearly see when we find this phrase repeated many times in the Bible. We are shown from the beginning of history that God's love was ever present in all He did and it is still with us today. In His love for us, God promises that He will never leave us or forsake us, that He will guide us and protect us; that we're forever His if we only believe in Him. In loving others with Christ's love, we are loving them with an everlasting love. In saying that we love God, we are required to love others and loving others doesn't mean for a short time, it means forever. We must love with the same undying love like Jesus. Before I go, I would like to quickly summarize each point again. One, God is love. Two, love is a gift. We do not deserve to be loved and there is nothing we can do to obtain it. Three, love forgives. Four, love is unconditional; no matter who we are or what we've done, God still loves us. Five, love is a sacrifice. Finally, true love is everlasting; it never ends. No matter what, God's love is an undying love. I have now come to the end of the six aspects of love that I chose to speak about today, and it has left me feeling so small, yet strong in knowing that I can love Christ because He loved me first and with His love, I can love others like He does. I am excited to see how God will use me to touch others with His gift of unconditionally forgiving and sacrificial love that will never end. I want people to see His love in me, through a smile, an encouraging word, a hug, in sharing a moment to listen, to cry, or to laugh. Though that's my desire, I am a selfish, sinful human and am greatly guilty of not loving others with a pure love as I should. I need Christ's love just as much as anyone, but as I have accepted this gift, it is my role as God's daughter to share that love with others. I hope also that each one of us, myself included, can examine our hearts and honestly answer some very important questions. Do I love like Jesus? Do I really love those who hate me, the hypocrites and idolaters - sinners - just like me? Can others feel Christ's love through me? Love comes from the heart. What is in the heart comes out, so if there is love, it will show in the way we treat and interact with others. It is my prayer that we will all be able to love like Jesus. And if we take this to heart and love like Jesus, the world will see a glimpse of His love and want it too. As the Christian author and speaker Ann Keimel used to say "With me and God and you and love, we can change the world. You watch, you wait." Please use the form below to submit your own high school graduation speech and inspire others to write their own! Share your high school graduation speech! Best Speech Topics has my permission to publish this speech as a permanent page on its site, in exchange for an active link to my website if I have one. This high school graduation speech is my own original work and does not violate anyone else's copyright. I agree that my speech may be edited for spelling, grammar and punctuation.